It’s a luxury to have the devoted instruction of an accomplished professional for one hour a week. (No wonder students like meeting with me alone for an hour to work on their writing.) There is an intensity to the learning experience that is different from a group experience that is a deep pleasure. The learner is also scarily exposed in a private lesson; there is no stepping to the side to let someone else skate ahead, and there is no half-assed trying just to get a little cheap credit for having gone through the motions. For example, a few weeks ago during a lesson, Fred demonstrated the 3-turn on one skate and signaled for me to try. I hesitated, afraid and tired, and wondered about the ethics of pleading an excuse. If I said, “Uh, not today,” would he let me off the hook? Then I thought of a student of mine who is shy of making presentations and who, in a 1:1 rehearsal with me, had politely refused to stand up and face me while rehearsing. Instead, she said she was more comfortable sitting and looking away while she practiced her remarks. I recall thinking she was missing an opportunity to take a risk, one she really needed to make to progress as a speaker and in the class. So, when it was my turn, weary and uncertain as I was, I glided forward, turned on one skate, and fumbled my way backward. And, of course, after the first time, Fred prompted me to do it again. Lesson: (4) Trust the teacher, and let him teach you. Motivation is built in to the lesson. It’s on my calendar; I show up; and I spend an hour with another person for whom skating is a life. Practice is another thing: I am accountable only to myself. I could go or not go; after all, no one’s taking attendance. I could go and just skate around the rink a few times and be glad of the cardio benefits. I could go, get discouraged, and leave early. All those things I have done. Here’s another takeaway from my learning-to-skate experience: (5) Practice for at least an hour each time you go, and practice at least three separate times a week. Why the hour, or more? Well, I’ve noticed that in the first 30 minutes or so of skating, I’m repeating what I already know. I discover nothing. I encounter no challenges. Around the 45 minute mark, I reach beyond what I know and falter (Why am I turning this way when I want to be heading that way? ), I remember a coaching suggestion (“Arm back more” or “Look in the direction you want to go”), and I apply it. I fail. I try again. I try enough that I gather some insight into the problem, and this I can use in my next lesson with Fred. Sometimes I try enough over many practice sessions that I start to feel what it is I’m learning. You know? I’m incorporating it. Although I inch forward, many fundamentals I have yet to master. More than anything else, by the end of the summer I want to nail the forward crossovers — and by nail, I mean beautifully — and I want to have some not-awkward skill with the backward ones. That’s four sets of moves: forward clockwise, forward counter-clockwise, backward clockwise, and backward counter. At my last lesson, I felt I was making some gains with the forward counter-clockwise ones, for me the most comfortable ones. I could probably practice those enough and nail them soon. But then Fred articulated something I know is true but counter-intuitive: (6) When you practice, practice first the edge or direction you’re not comfortable with. What you learn there will transfer to the edge or direction you find easier. I have learned a lot in 5+ years of intentional skating and especially in the past several months. I believe, actually, that I skate as well as the woman who originally inspired me. She was like a strong bird on the ice, gliding powerfully yet lightly, around and around to the music on the loudspeaker. I think I can do all that now. What’s really interesting about learning something new as an adult, however, is that the more I learn the more I am aware of what I don’t know. The little marker I placed for myself, called Goal, I keep shifting it ahead of my reach. At the Ice House, where I bought my skates and where I get them sharpened periodically, one of the guys predicted a couple of years ago that soon he would need to sharpen the edges for jumps. “Oh, no,” I replied gravely, “These skates are never leaving the ice.” You know what, though? I have since changed my mind. I do want to jump. Lesson? (7) The more you learn, the more you want to learn more. 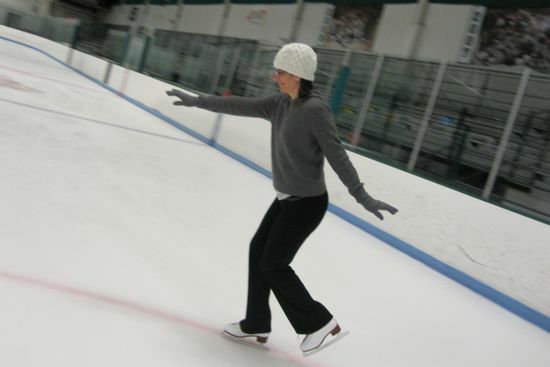 Photograph of me by Grace Guterman, taken on May 26, 2011 at the Babson College rink, one of the best nearby and open year round, with plentiful public skating and freestyle hours. Love, love, love it. And you’ve just reminded me that I need to sign up for group piano class again this summer, since pretty much every lesson you’ve learned about skating applies to (re) learning a musical instrument. Off to do that!